I'm way out of the hood, walking to the bank with Miss Peach. We cross the street, I look at the newsstand, and who is staring back at me??? We are talking WAY. OUT. OF. THE. HOOD! Is Kirsten Dunst taking over??? Okay- that's bizzare. They're branching out! I used to live in Chi-town... say it ain't so! 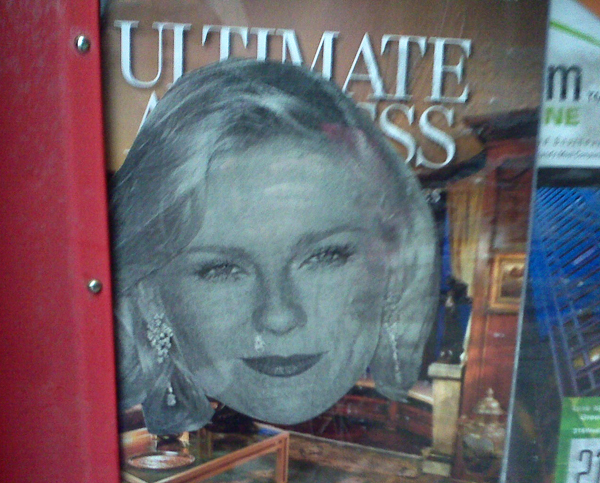 Quick- go to Bucktown and tell us if you see Dunst! Hah. She can take over MY city anytime. Why not? Everybody else is running - and NONE of them look anywhere near as good as she does.